Do You Need Professional Lice Treatment Services? If you are like most parents when faced with a lice infestation you might first go to the to a drug store and buy an over-the-counter lice product that may or may not contain harsh and toxic ingredients and that is probably not very effective. However, more and more parents find the problem of getting rid lice and their eggs (the nits) so overwhelming that they opt to call in professional help like Lice Treatment Center®. 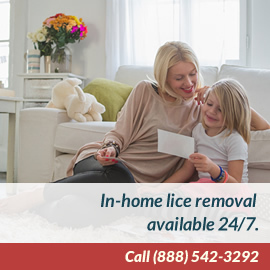 LTC® is a pediatrician-owned lice treatment service with a long and successful record for lice removal and prevention. LTC ®has provided help to more than 250,000 families as well as schools and camps since 2006. LTC® employs only technicians who are trained and certified in its physician-designed protocol and who use only the Lice Treatment Center’s line of pediatrician-formulated, natural, non-toxic lice treatment and prevention products to perform lice removal treatments. 2. Divide hair into 1/8 inch segments. 5. Repeat the sectioning and combing process. 6. Once the hair is clear of nits and bugs, the technician will apply LTC’s Treatment Oil to the scalp to be left on overnight and shampooed the following morning with Treatment Shampoo. After the lice removal service is completed for family members, LTC technicians will help evaluate the home environment. Everyone treated by LTC’s Lice removal service must follow the specific LTC aftercare protocol for at least 7 days to ensure total lice removal. If any lice or nits are still present 10 days following treatment and careful aftercare has been carried out, LTC will return for a recheck and possible re-treatment.